I have SERIOUSLY tried EVERYTHING under the sun. My skin always felt dry and flakey and I would have MASSIVE break outs every single month! and the zit is gone in one day! NO JOKE!!! OK, I am getting ahead of myself...let's start from the beginning! Apriori is all about being 100% PURE! Meaning you will NEVER put anything on your skin that is a harsh chemical or that isn't natural. I've using Apriori now for the past few months and I HONESTLY have to say that I will NEVER use anything different. People close to me have REALLY seen a difference in my skin. They say it glows and that it just Looks healthier! I would have to agree with them. Even Brett has noticed how much softer it has become. Starting with a good cleansing system is the foundation for great skin. And then after that you can build on different products that can make a HUGE difference with skin when it comes to fine line and wrinkles, age spots etc...!! Over the next few weeks I will introduce you to several different products that I love and have made a difference for me. 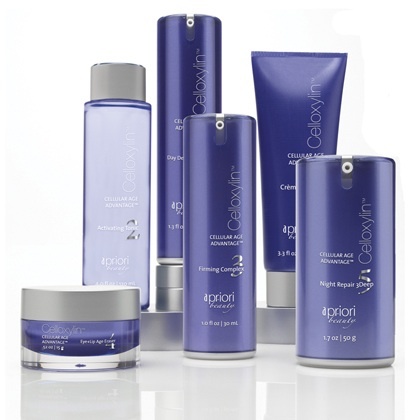 It's really everything you need for great skin all in one set! If you are in need of SOMETHING for your skin NOW, go ahead and become a client and order today. If after 30 days you feel like Apriori isn't everything you had hoped for (which I PROMISE it will be:) you can return it and get all your money back. Soooo you really don't have anything to lose. Can't wait to tell you all about the Derma Firm Illuminator machine "DFI" I'll save that for next time! Wow! A great review and inspirational. I've been hearing good feedback about Apriori. I better check this one also.